A report from Downtown Manhattan, and a Hurricane Sandy volunteer. Hi all. Greetings from Lower Manhattan. Without power, access to the Internet or any kind of phone service, my news is nowhere near as interesting or as useful as my cousin’s (below). In a nutshell, what I’ve learned amounts to this: support and keep alive your local independent radio station. Never, ever, throw away that old bag of camping gear. As soon as you can, purchase a lightweight flashlight/headlamp. Share cowboy coffee with your neighbors if you’re lucky enough to have it (and them). All are invaluable. Also, love any local library that will let you in, anyone with a wireless router who leaves their network open and be glad of a toilet tank which you can access. I’m fine, this is not about me, but most of the hospitals in lower Manhattan have now been evacuated, except for Beth Israel (which seems to be open). Those who need hospital services are spending hours each day commuting. When downtown New Yorkers come out of this, we need to fight like hell for a full-service hospital in our community. Dear Lloyd Blankfein, Chief Executive Officer of Goldman Sachs: The global headquarters of your firm is situated in Battery Park City. The well-to-do community built on landfill west of the World Trade Center, connects, I am told, to a different grid from the rest of lower Manhattan. 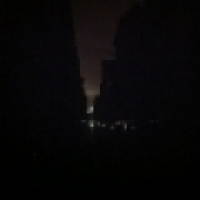 Still, 200 Water Street seems to have kept every light on every floor illuminated since Sunday. Are you trying to send a message to the rest of us about your power? From our very dark, increasingly quiet and cold apartments we see you through our windows and we get it. I am writing this from my dining room table in my well-lit apartment with chips and avocado by my side and a glass of fresh, cold, clean water. My cellphone is charged and my house is warm. Williamsburg came through the storm almost completely unscathed. Hundreds of thousands of New Yorkers were not so lucky. If you want to know how you can help, go here. Today I volunteered from 11am to 9 pm at the Red Hook Initiative, a youth services organization serving the Red Hook neighborhood of Brooklyn, whose incredible staff (who live in public housing) opened their doors today to operate as an impromptu center for receiving and distributing supplies, cooking and serving a ton of food for something like 200 people, and giving out information to comfort to the community. They are the only thing going in that area so far (I heard reports of some other places maybe starting up but not sure whether they are really up and running yet). The local community center owned and run by NYCHA (Housing Authority) was closed. People are very stressed, frustrated and scared to be living in the dark. There are robberies happening at night. People can’t see in the stairwell. They are afraid to leave their homes but they have no supplies. There are diabetics who need to refrigerate their medicine. There are elderly people who can’t walk down stairs. There are mothers with small children who can’t get diapers—all the stores are closed. People can’t shower or cook or wash anything. I was told that 70 percent of people living in public housing down there, which someone estimated was 15,000–20,000 people, are without power. Keep in mind that this community is already highly marginalized—far from services, with peeling paint and poor management, where people in at least one building last year went three months without stoves and were told to cook on hot plates instead. Nevertheless, when people came to us today they were calm, polite and grateful. People lined up for batteries, candles, clothing and food, and I didn’t hear any tense words all day. The woman in charge today was a middle-aged African-American lady named Cheryl with a big voice, a lot of energy, a lot of organizational drive, and anger at city government for constantly turning its back on Red Hook. Also a key presence was Tony, a large, loving, Muslim woman who had a gentle word for everyone in the whole place and who seemed to have every teenager in the projects under her thumb. Cheryl was assisted by a squadron of young women and a few young men who organized people to come charge their phones, printed flyers, entertained children, brought word to the people out in the projects about what was going on, sorted and distributed clothes and a ton of other tasks. On the volunteer side, there were a half-dozen occupy trained organizers on-site doing kitchen, social networking and media outreach, community outreach (biking around to any local organization or establishment that might have resources or information) and organizational infrastructure. Today I saw Occupy alive, providing much-needed support and coordination of efforts to help the slightly overwhelmed RHI staff serve the population. An incredible woman in a bright pink sweater stepped up to coordinate all the kitchen work—her name is Lisa, but I call her Pink Wonder Woman. A student named Zoltan biked around to all the local community service providers and attempted to figure out who else can come online to help distribute supplies and food. About fifteen to twenty-five other volunteers were on site—maybe Occupy or not, I’m not sure—who chopped and prepared food and processed intake and distribution. People arrived throughout the day to deliver supplies of all kinds, all of which were needed. Paper towels, batteries, flashlights, toilet paper, paper plates, non-perishable ready to eat foods, water (tons of water)—all gratefully received and redistributed. When I arrived this morning, I was first told to drive people to the grocery store, but that direction got nixed by Cheryl, who deemed that a really inefficient use of resources. This turned out to be a good call as there was tons of food coming in the door. Cheryl early on called for a 4 pm community assembly at a nearby public landmark (“the flagpole”) and asked me to help coordinate messaging to the outside world via social networks, especially seeking media contacts to come report on what was going on at RHI and to spread the word about the meeting. Over the course of the day, I spent several hours e-mailing everyone I could think of and getting linked up to other nodes in the Occupy network. I found out that one old friend of mine has a direct line to FEMA, so was sending information to that person about Red Hook to try to put us on the map. A Village Voice reporter contacted me and I put him on the phone with Tony the neighborhood grandma, who described in exquisite detail the suffering that she was seeing in the neighborhood. Early on in the day volunteers passed out forms for needs assessment, which pretty much all came back saying the same thing (flashlights, batteries, water, food, etc. ), so I passed that information on to the networks. I contacted a local representative I met last winter and got him to spread the word about the 4 pm assembly to his contacts. I researched information about timelines and services and worked with the team to put together an agenda for the 4 pm assembly. At 4 pm, I encouraged Cheryl to tear herself away from RHI to come to the assembly. She left people in charge of letting people in the door to charge their phones. No one was allowed to come take supplies between 4 pm and 6 pm to allow the volunteers to prepare the dinner. We walked three blocks down and saw that there were about 100 people gathered at the flagpole being addressed by Zoltan, who updated them on what resources were being distributed out of RHI and what the wider situation in NYC is. People were very hungry for information about when the power would come back, about FEMA, about the water that had flooded their basements. They wanted to know about food and shelter and why all the services were moving so slowly. Cheryl and the rest of us made announcements to the crowd about what resources and information we have. We asked people to come back at 10am to form working groups and at 4 pm for another community assembly. We will keep having those every day until the power returns. A representative from Congresswoman Velazquez’s office spoke about what is going on throughout the district. There are something like 85,000 public housing residents without power. Coney Island is ravaged. The LES is ravaged. Frustrated residents complained about the slow response—he promised to bring that information back to his boss. At the meeting, I was approached by a woman from the Cobble Hill parents’ list who said she was coordinating supplies and as many volunteers as we could use. We were joined by two women from Trinity Church who are in charge of two massive semi trucks full of supplies that are being delivered here and in downtown Manhattan tomorrow for distribution. I put them and the other organizers from today on an e-mail chain so we can coordinate our resources and information, which is always challenging in a fast moving situation. At 6 pm, RHI opened its roll-up side door to a line of hundreds of people who had been patiently waiting for food. Each person received a plate of hot food, a small bag of supplies (water, canned goods, candles), some candy if they wanted it, baby food if necessary, and paper towels and toilet paper if they needed it. People were very grateful for our help and the mood was good. They covered their food with tin foil and carried it away back to dark buildings, where other children and grandmothers and sick people waited for help. Tomorrow we are going to do it all again, hopefully this time building on the lessons of today (have a volunteer coordinator, for example), and hopefully being able to process the large influx of volunteers and supplies we are going to get. The upshot for Red Hook is that it is very close to wealthy communities of people who want to donate their time, money, and stuff to help. I must say that Lower Manhattan is not so lucky—there is a massive amount of people there without access to food (stores all closed), power, Internet, etc. I am hoping that there are some major efforts to get relief there working because so far, there is nothing doing. Whether you're in New York or elsewhere, find out more about how you can help with hurricane relief.